The toxic truth will finally be told. TOXIC Beauty details the true cost of our collective overexposure to unregulated toxins through personal care, and the causal link between talc and ovarian cancer. The chemicals we use and absorb each day in the name of beauty and hygiene are causing us great harm. Directed by Phyllis Ellis. Produced by White Pine Pictures. Conceived by Sarah Jay. Because you’re worth it. For SUSTAINABILITY Reboot I return to FASHION Magazine to guest edit this important issue which contains many firsts: a Carbonzero offset of the printing impacts, an editorial shot at a recycling & reuse facility, and 3 different references to The Lorax. Slowly, surely and chicly, sustainability is becoming the new normal. Honoured to to be recognized by The Canadian Art and Fashion Awards for my work in sustainability, alongside game-changers Wuxly, Brave Soles, Matt & Nat, Ron White Shoes, and With Love Darling, who are all working to shift the exploitative status quo, and prove that fashion can be a force for good. Farm to Fashion is the first runway show of its kind to be curated around climate beneficial fibres in celebration of fashion’s agricultural roots. To kick off the Regenerative Earth Summit in Boulder, Colorado, Farm to Fashion features 27 brands from around the world who share a commitment to supporting the health of our soil and the restoration of ecosystems. Produced and curated by Sarah Jay. By shifting to more sustainable and regenerative business models, the fashion industry has the power to positively impact the environment and millions of people worldwide. Fashion Takes Action hosts the 5th annual World Ethical Apparel Roundtable, bringing thought leaders together to discuss ideas and innovations to move fashion forward. Proud to be consulting on the inaugrual IFWTO - an arts and culture festival dedicated to nurturing and celebrating the fashion, textile design, and traditional crafting practices of Indigenous artists, while fostering economic development and inclusion. May 31-June 3, 2018. Join us at Fashion Takes Action's World Ethical Apparel Roundtable to discuss WATER, WASTE, LABOUR and TEXTILES, and take part in a special screening of RIVER BLUE. Hear from experts, share ideas, and ask the tough questions needed to drive fashion forward into a more sustainable future. Host Donna Bishop, Fashion Takes Action's Kelly Drennan, and I, discuss the fashion revolution in which we find ourselves, the 5th anniversary of Rana Plaza, and how I accidentally became a fashion activist. Thank you to CAFA and Fashion Talks for having me. Listen here. Did you know that professional wet cleaning is a safe and effective alternative to dry cleaning? Reunited with with Environmental Defence to bring awareness to the hazards of cancer-causing chemicals like PERC, and transition industry towards non-toxic garment care practices. There are many decisions a designer can make to support people and planet through fashion. Join us for the 3rd Annual Design Forward Award where finalists Obakki, Anian and Triarchy will be recognized for their commitments to sustainability. May 29th at the Berkley Church. Tix here! Thank you, Fashion Revolution, for including my photography of Rana Plaza in the 2017 Transparency Index, which ranks 100 of the biggest global fashion brands and retailers based on their transparency and communication surrounding social and environmental impacts, practices and policies. 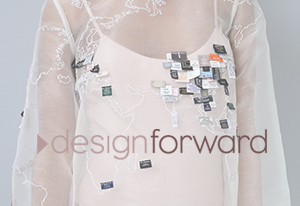 On October 3rd the winner of Fashion Takes Action's Design Forward Award will be revealed at the Expo for Design, Innovation and Technology. Congrats to our three finalists, Omi Woods, Triarchy Denim and Peggy Sue Collection for your vision and integrity, and for changing the world by design. In good company at BeyondBrands - a conscious consulting collective united to help brands grow their businesses sustainably. I'll be advising on #FairFashion & #CleanCosmetics. So happy to support my friend, Marci Zaroff, eco fashion and lifestyle pioneer, in the writing and research for her new book, ECOrenaissance, a lifestyle guide for co-creating a sustainable world, with tips on beauty & wellness, fashion, food and conscious business. My friends at Fashion Revolution included some of my photography in their first FANZINE ♥ 72 pages of pix, poetry, illustration, design & editorial, the collectible zine explores the hidden stories behind our clothes, and how our purchasing power can make a positive impact. When your work for a cause near and dear to your heart is featured on VOGUE.COM ♥ Please take a moment to donate directly to Sreepur Village Organization who responded to the 2013 Rana Plaza factory collapse in Bangladesh by stepping in to support the continued education of 200 children orphaned by the tragedy. Thrilled to be co-producing and styling the Artisan Hub event for the Trade Facilitation Office of Canada in partnership with Fashion Takes Action, ft. samples from artisan communities in 8 developing countries in preparation for the Ethical Sourcing Trade Show in 2017. GUN CONTROL x SARAH JAY for the win at the annual TFI NEW LABELS show. Gun Control by Defne Husrevoglu is a music-inspired street couture line made in Canada. Genderless and geometric. #StyledBySarahJay. CONSCIOUS. CURATED. CATWALK. Fair fashion, Canadian-made. A runway show curated and #StyledBySarahJay, sponsored by H&M, hosted by Fashion Takes Action. 10 designers + emerging talent that represent the future of fashion. Launching 2019, AE is a collaborative consulting firm bridging gaps in the fashion and beauty industries to improve supply chain transparency for the health and safety of #AllEarthlings. A three part showcase inspired by David and Iman at FASHION ART TORONTO. Designed by Evan Biddell. Fashion consulting and styling by Sarah Jay. Dedicated to the one and only, David Bowie. A film and installation by Laura Gildner and Sarah Jay at FASHION ART TORONTO addressing garment worker safety in a post Rana Plaza world and the human costs of fast fashion. Working with Environmental Defence on the Just Beautiful cabinet, helping consumers make informed decisions about product safety, and working to change the policy surrounding the hazardous toxins in cosmetics and personal care products. Join me at Fashion Takes Action's 2nd annual World Ethical Apparel Roundtable, Canada's sustainable business conference for the apparel & textile industry where I'll be moderating panel discussions on ethical sourcing and transparency, and sharing a bit about my experience visiting Rana Plaza in the fall of 2014. So ahead of our time…The Green Shows was a runway, pop-up retail and consulting company based in New York, supporting the luxury sustainable fashion community. So proud that what we built was fashion first and blazed the trail for the fashion revolution now well underway. Proud to have founded the Fashion Revolution Canada Instagram Account, Fash_RevCan. Be sure to visit / post / tag brands and ask them: #WHOMADEMYCLOTHES? Your voice can transform the fashion industry. Be curious. Find out. Do something.